The 2004 Fort Collins Old Town Half Marathon was my first flat half marathon. Last year, I had been running 10-14 miles per week during Jan/Feb/Mar. I did a reverse taper, putting in a 31 miles the week of the race. Overall, I was quite happy with last year's time, considering the training factors, but this year, I felt that I was in considerably better shape. Obviously, my goal this year was to significantly exceed last year's time (1:50:16). I decided that 1h40m would be a good goal to shoot for. My training for this race really started back in November. After taking a few weeks off from last year's racing season, I started doing quite a bit more of my running at an aerobic pace (defined as under 70% of my maximum heart rate). I was averaging 15-20 miles per week through the winter, with a couple of longs runs (12 and 13 miles) in December. I also bumped up my usual run distance to 7.5 miles, which I feel has greatly helped my endurance (last year, I usually went on 5-mile runs). By January, my aerobic pace was starting to significantly improve and I set my first PR for the year at Coyote Ridge. In mid-January, I PRs for the 7 and 8 mile distances as well. In February, I started to get a little frisky and added some anaerobically-paced hill runs. I improved my PR for the Horestooth Mountain Trail Race route by over 3 minutes. I did a long run of 9 miles in both January and February, but I got sick for about 3 weeks, so my training was stunted -- I needed to back off on the intensity and rebuild my base. In March I was pretty consistent with alternating tempo runs with recovery runs, but my overall mileage was still low because I did quite a bit of skiing. Towards the end of the month, I started doing some fast, long hikes. 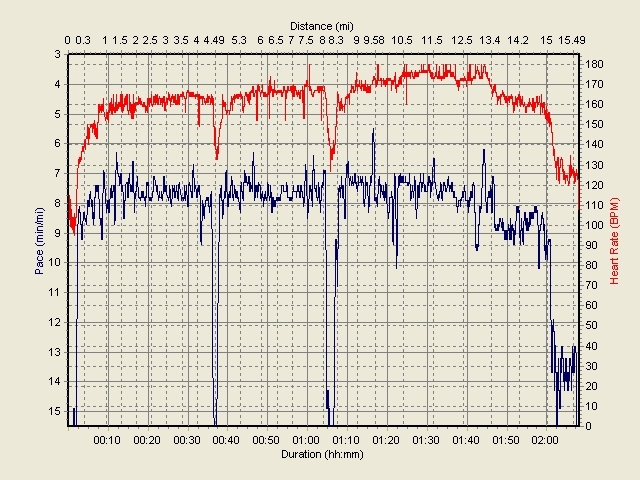 This is the heart rate and pace graph of my training run with Dan Turk on April 24, 2005. We ran the actual course exactly two weeks before the race. This was my first run over 13 miles since December 2004. We took two walking breaks to eat some Gu Energy Gel at miles 4 and 8. We had started conservatively (aiming for 8 min/mile), then tried to pick up the pace 15 sec/mile after mile 9, which worked out quite well. I set a number of PRs during this run (click here to see my PR progression) and finished strong, so I was feeling pretty good about my training thus far. A week before the race, I did an "over-distance" training run (May 1, 2005). This was a risky move, because most people start their taper sooner than a week before the race. I felt that a week should be long enough for me to absorb this new training, and that the positive training benefits would probably outweigh the negative impacts. It turned out to be a very good run. I used this run to see what would happen if I pushed harder from the beginning. I aimed for a heart rate of 166 for the first half, then picked up the pace at about 9 miles. I went anaerobic and ultimately had to slow down in mile 12, so I didn't finish the 13.1 miles as strongly as I had hoped, but I still bested last week's time by about 15 seconds. I was a bit tired out from a tempo run that I had done on Friday evening as well, so overall, I was pretty pleased with this run. I jogged the last 2 miles bac towards home to set a new PR for the 15 miles (1:58:53) -- I averaged under 8-minute miles for the entire distance! After reindoctrinating myself with John Parker's 'Heart Monitor Training for the Compleat Idiot', I decided that I should try to stick as close as possible to the general maximal heart rate for the half marathon distance: I should run at 80% of my maximum (using the Karvonen method), which for me is a heart rate of 166 beats per minute (bpm). I decided to try to keep to this "heart pace" through mile 8 or 9, then pick it up from there. This had worked out quite well in my first full distance run two weeks before the race (although I ran the first 8 miles at a more conservative pace). I also decided that a little bit of 'cheating' would be okay, since it would be pretty unlikely that I would actually bonk in a half marathon -- more likely, I might just go anaerobic and have to slow down for a bit. Caution is thrown to the wind (literally) . . .
Last year I got boxed in near the back and ended up running the first mile pretty slow (which was probably a good thing, since it forced me to get a good warm-up). I threw caution to the wind right from the start. I was excited and my energy level was high, so when this year's race started, I quickly zipped away to avoid getting trapped in the big swarm. Within about a quarter of a mile, I was already to my target heart rate and running close to a 6 min/mile pace. I shouldn't have let myself get so carried away, but I was feeling fast and strong, and with the tailwind, I wasn't sure that I wanted to be conservative at this stage. My heart rate monitor was giving erroneously low readings (like 80 bpm), so I didn't have a good measure of how badly I was exceeding my planned target rate. From my breathing and a few sporadic numbers, I guess that in mile two, my heart rate might have been 170-180 -- at my anaerobic threshold. I decided to use the first couple miles of initial strength to make some hay, but I soon paid the price. I ate a Gu energy gel a bit earlier than planned as well (mile 2.2) and this too came back to bite me. The tailwind was great as I exited the canyon, but I could feel my speed starting to fade. At this point, a small crowd of people passed my by. I started feeling rather foolish for my earlier indiscretion. Time to salvage this race . . . The heart rate monitor started working again at mile 2.5, and I quickly decided that I would be wise to reign myself in if I wanted to finish strong. A side-stitch hammered that point home. I tried to back off some, and it worked, but with the tailwind my pace still felt quite fast. I passed the 4-mile mark at near PR pace. The dog-leg section of the course began right after 4-miles, and soon I was headed directly into the wind. This slowed me considerably (down to nearly a 9 min/mile pace, and the race was starting to feel hard). I saw Eric on the other side of the dog-leg -- he was looking strong. Phil and Steve were not far behind Eric. I rounded the dogleg and got my tailwind back and things started to feel better, although my stomach felt like it might start complaining -- I could definitely feel the gel, water, and perhaps even breakfast sloshing around. This may have contributed to my recurring side stitch. I decided to try to run conservatively (~7:30 - 7:45) until mile 9 and pick things up again. This worked out well, and I started to feel better. I decided that I'd like to up my energy intake to stoke the fire for later, so I took another energy gel at about mile 5.5. 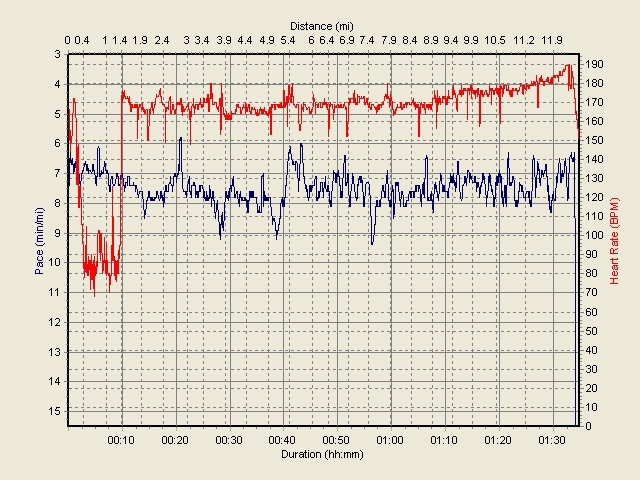 I obeyed the heart rate monitor quite well for several miles, even climbing the hill at mile 6. I made up some time on the downhill and passed a few people in this stretch. Then I backed off as we came into Laporte. I was getting a little bored, so I even talked to a girl from Boulder for about 1/2 a mile. By this point, I was feeling pretty good -- it seemed that I would have the energy to do the last 6 miles at least as fast as my goal pace. I slowed down to pop another energy gel at mile 8, during which time some people passed, but not for long. I started trying to speed up around mile 9, but it seemed that it was taking more and more effort just to maintain the same pace. I was still going faster than my goal pace, so I felt pretty good about how things were going. I didn't want to push any harder, because I wanted to save something for the last couple miles. I actually did speed up a bit, and started to slowly pass people in this section. The first marathon racer blew past me around mile 11 (last year, the first marathoner passed me in about mile 7). My side stitch kept threatening to return, but was mostly okay. I was praying that it wouldn't haunt me in the last few miles when I wanted to run faster. As I ran along the last three miles, I was starting to feel in my element. I had run this section of the course very frequently in the past couple years, and the speed at which the familiar landmarks were passing was gratifying. At about a mile and a half, I started to really kick things into gear. I picked up my breathing rate quite a bit to help stave off the inevitable oxygen debt. At this point, I was starting to occasionally run as fast as 6:30 min/mile pace. In the last mile, I passed quite a few people and got passed by one or two. Just before the trail turned onto Linden Street, a race official was calling out '0.4 to go', but I knew that it was actually shorter, so I kicked my pace up another notch, flying around the corner. The finish was about 3 blocks away and looked distant, but I knew that I was almost done. I was in a full sprint for the last two blocks and actually cruised past several more people. Having a strong finish like that is always a blast, and the crowd always likes a good show at the end. Finally, at 1:37:37.8, I was finished! 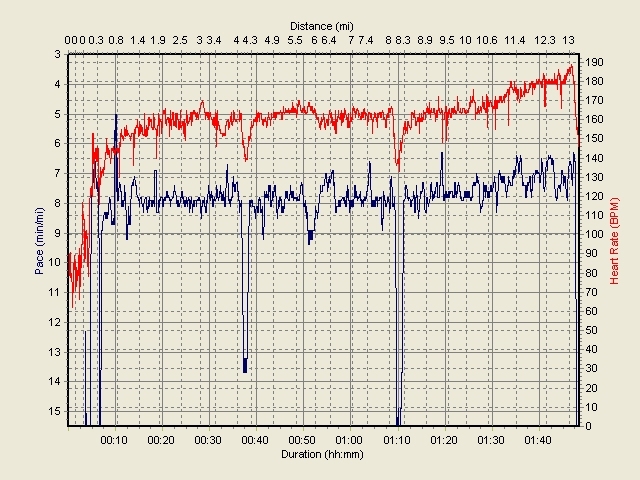 Pace (min/mile) and heart rate during the race. I forgot to the turn the data logger on until I'd already gone a half mile or so. The heart rate monitor gave erroneous readings for the first mile or so -- my actual heart rate was probably in the range of 168-181 during that time. 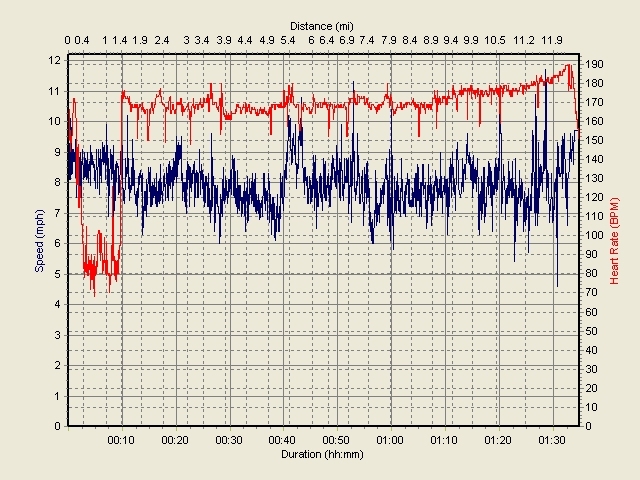 Speed (mph) and heart rate during the race.